Not sure what I am doing wrong with this MBD part. So I am trying to create this part, (see images and part file) and I am struggling with it. The 3mm dimension specifically. I believe I have the dimensions correct, yet I cant achieve that 3mm lip. 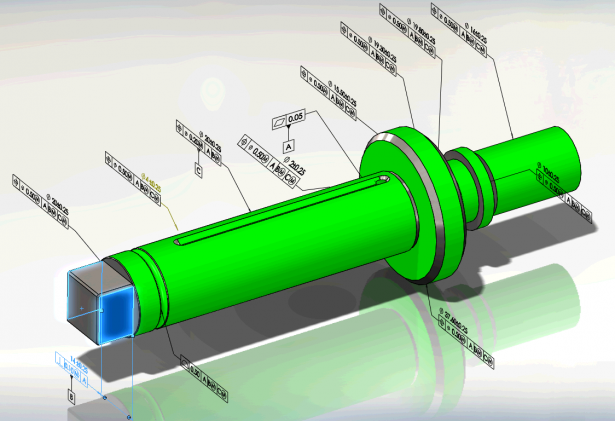 This is my 3rd month in creating parts from MBD drawings. -part file saved with 2018 sp3. Re: Not sure what I am doing wrong with this MBD part. I'd have to say the 3mm dimension is wrong or there is something going on in the drawing that is not obvious. Look at the 18mm ribs highlighted in yellow. It appears those ribs should be aligned with each other, but if so the blue highlighted lines should be on the same plane and they are not. The only way I can see this working is if on the opposite side of the part the 3mm dimension is 25mm. Also, I'm curious, what is MBD? Thanks for that info, I'll will start calling these 3D models instead. Yea, that's what I thought too. But I wanted to make sure. I didn't want to start another post. I have another drawing that seems off. Can someone confirm this? What I am questioning is circled and the arrow. I just want to make sure that I am not missing something.